This contemporary broadside explains, for the American Colonists, what happened on March 5, 1770. 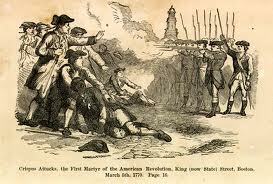 The incident which occurred on that day, in Boston, is known as the Boston Massacre. By March of 1770, many Americans no longer wanted British soldiers in the colonies. On March 5th, violence turned deadly. To the Patriots, it was the Redcoats' fault. To the Redcoats, it was the mob's fault. Crispus Attucks, an African-American, was the first to fall dead. (Follow this link to view the top-middle picture.) Four others died and six people were injured. The captain of the soldiers, Thomas Preston, was arrested for murder as were eight of his men. In an interesting twist of history, John Adams - an early proponent of American independence and the second President of the United States - successfully defended Preston and six men. Two others, found guilty of manslaughter, were branded (the link depicts branding examples) before they were released. Parliament - in another concession to the colonies - ended the Townshend tax for everything except a tax on tea. Failure by the British government to abolish the tea tax led to another famous event: the Boston Tea Party. On the 16th of December, 1773, colonials disguised as Mohawks boarded English ships in Boston Harbor and dumped all 342 containers of tea into the harbor. That act of defiance remains an important event for Americans. Retaliating against ongoing colonial disturbances, Parliament passed a series of coercive Acts in 1774 (called "Intolerable Acts" by the Americans). One of those Coercive Laws (the Boston Port Act) effectively ended all commercial shipping in Boston until Massachusetts paid the tax (on the ruined tea) and reimbursed the East India Company (the tea's owner). The colonials, however, had no intention of either paying the taxes or reimbursing the company. Another law (the Massachusetts Government Act) made town meetings illegal and revoked the colony's charter. British officials (under the Administration of Justice Act) who were accused of committing crimes were no longer subject to the jurisdiction of Massachusetts courts but could be returned to England to stand trial. Perhaps most infuriating, all colonists were ordered (under the Quartering Act) to provide housing for British soldiers. Britain's goal was to temper the actions of independent-thinking Massachusetts colonists. However, Parliament's harsh laws had the opposite effect. Not only did the laws fail to intimidate people in Massachusetts, they helped to rally other colonists who also voiced objections to British rule. Leaders in Virginia, for example, proposed that the colonies should collectively discuss their objections to His Majesty's government. That proposal ultimately led to the First Continental Congress which met in September of 1774. 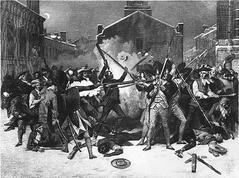 The situation in Boston worsened when a British General - Thomas Gage - took over as Royal Governor of Massachusetts. With four regiments of British troops moving into Boston, rebellion was close at hand. Bos, Carole "THE BOSTON MASSACRE" AwesomeStories.com. Oct 07, 2013. Apr 25, 2019.